This report presents estimates of the size of the shadow economy in Moldova and Romania during the years 2015–2016. The estimates are based on surveys of entrepreneurs in both countries, following the method of Putniņš and Sauka (Journal of Comparative Economics 43:471–490, 2015). The components of the shadow economy captured by this approach include misreported business income, unregistered or hidden employees, and ‘envelope’ wages. Our findings suggest that both Moldova and Romania exhibit high levels of bribery, which is influenced by the number of unregistered companies. 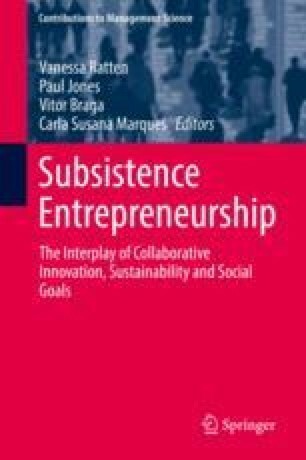 The results of this chapter highlight the importance of focusing on different forms of entrepreneurship particularly in transition economies. A prior version of this chapter or some of its contents have been presented/published in Centre for Sustainable Business at SSE Riga discussion paper series. We are grateful to the Centre for Sustainable Business at SSE Riga for the generous financial support that made data collection in Moldova possible as well as to the National Scientific Research Institute for Labour and Social Protection for funding data collection in Romania within the project PN 16440102 entitled ‘The impact of labour market institutions on informality. Micro and macro approaches’. We would also like to extend our gratitude to all entrepreneurs who agreed to participate in the interviews. My name is … from …. We are conducting a survey aimed at understanding entrepreneurs’ satisfaction with the entrepreneurship climate in Romania and Moldova. The main interest of the study is to find out how various policy initiatives implemented within the country and entrepreneurs’ satisfaction with the business climate influence entrepreneurial behaviour, including tax avoidance. I would like to emphasize that we are only interested in your expert opinion and in no way are we indicating, for instance, that your company is involved in any type of tax avoidance activities. The interview will last approximately 15 min. We guarantee 100% confidentiality as neither your name nor your company’s name will appear in the data analysis. Data will be analysed using a computer programme without any reference to the data source. If you are interested, we can also send you the summary of the survey results once the survey is complete. This survey is very important for fostering knowledge about entrepreneurship in (Romania/Moldova). By participating in this survey, you are helping to improve such knowledge. All your answers will be 100% confidential and no one will be able to trace them back to you or your company. Moreover, we are interested in your expert opinion, and what you say will be attributed to the industry or your competitors, not your firm. Please evaluate your satisfaction with the performance of the State Revenue Service with regard to tax administration. Please evaluate your satisfaction with the government’s tax policy in (insert country). Please evaluate your satisfaction with the quality of business legislation in (insert country). Please evaluate your satisfaction with the government’s support for entrepreneurs in (insert country). Tax avoidance is tolerated behaviour in (insert country). Bribing is tolerated behaviour in (insert country). Please estimate the degree of underreporting business income (in percent) by firms in your industry in 2016_______ % and in 2015 _______ %. Please estimate the degree of underreporting number of employees (% of actual number of employees) by firms in your industry in 2016_______ % and in 2015 _______ %. Please estimate the degree of underreporting salaries paid to employees by companies in your industry (for instance, if in reality an employee receives EUR 400, but the reported salary is EUR 100, then underreporting is 75%; if EUR 400 and EUR 200, then underreporting is 50%). Firms underreported actual salaries by approximately ____ % in 2016 and ____ % in 2015. On average, approximately what percent of revenue (turnover) did firms in your industry pay in unofficial payments to ‘get things done’ in in 2016_______ % and in 2015 _______ %. When other firms in your industry do business with the government, approximately how much of the contract value do firms typically offer in unofficial payments to ‘secure’ the contract? (year 2016)_____%. In some industries, in addition to registered companies such as yours, unregistered enterprises also operate but do not report any of their activity to authorities. In your opinion, what percentage of your industry’s total production of goods/services was carried out by unregistered enterprises in 2016?_____% in 2015? _____%. If a company in your industry was caught for deliberate misreporting, what would typically be the consequence for that company? What is the approximate percentage change in your operating profit, turnover, and total employment in 2016 compared to 2015? What was the approximate operating profit of your company in 2016? What was the approximate turnover of your company in 2016? Approximately how many employees are currently employed at your company (full time equivalent, including you)? In what year did your company start operating? What is the main activity (i.e. sector) that your company is engaged in? As I list some factors that can affect the current operations of a business, please tell me if you think that each factor is no obstacle, a minor obstacle, a moderate obstacle, a major obstacle, or a very severe obstacle to the current operations of this establishment. Notes on some of components 1–7 follow. Income refers to both business income and employee income. Illegal production (3) includes production of goods/services that are illegal regardless of who produces them (e.g. narcotics, prostitution) and production of goods that themselves are legal but the production is illegal because it is carried out by an unauthorised producer (e.g. unlicensed surgeons, unlicensed production of alcohol). Goods/services that are produced legally (2) can still involve breaches of the law at the registration or reporting stage (e.g. intentional underreporting of profit to evade taxes). Most of the income generated from producing legal goods is reported by registered firms and therefore fully captured in official GDP (6). However, some proportion of income is intentionally hidden from authorities either by not registering the enterprise (5) or by misreporting wages or company earnings (7). 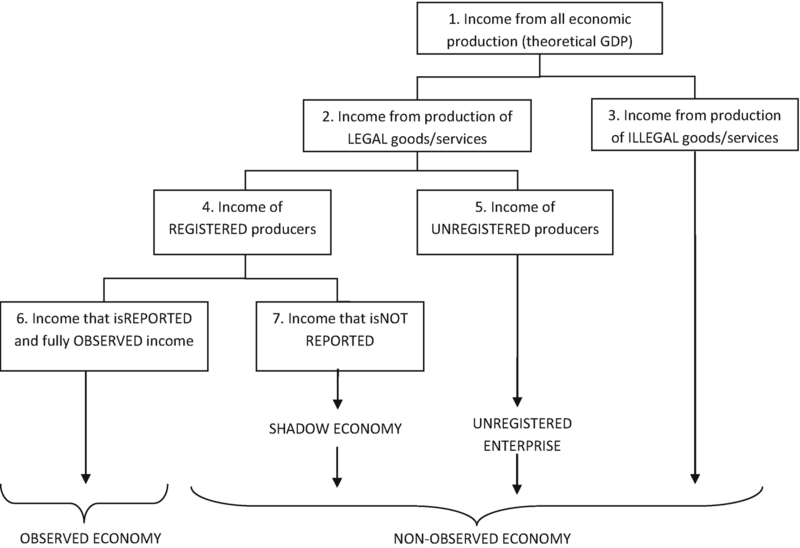 Following other studies, we refer to the latter (7) as the ‘shadow economy’ and use the term ‘non-observed’ economy in a broader sense, referring to illegal goods/services, activities of unregistered enterprises, and the shadow economy (Fig. 31).